Another new book release today! No, it isn’t mine yet, but I promise you that some fabulous dairy-free books are in the works! 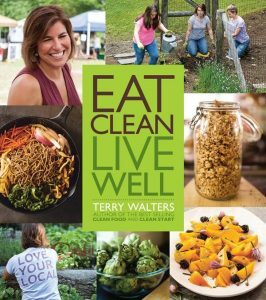 This one is Eat Clean Live Well by Terry Walters, and as a special preview, she is sharing this sweet holiday recipe with us for Chocolate Peppermint Slice. I’ve got Eat Clean Live Well on order, so that I can check it out and share more details. 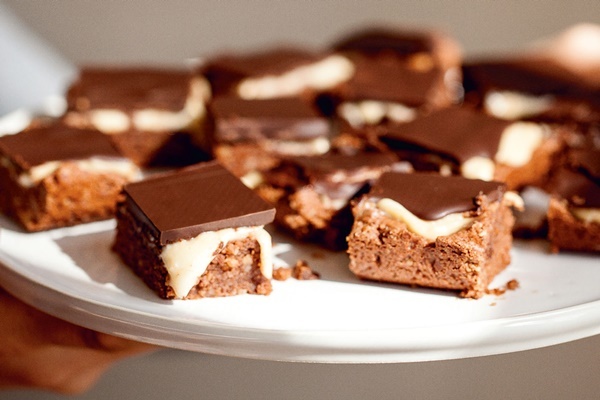 But since today is the official book release date, a few book notes and this Chocolate Peppermint Slice recipe should satiate you who want something now! 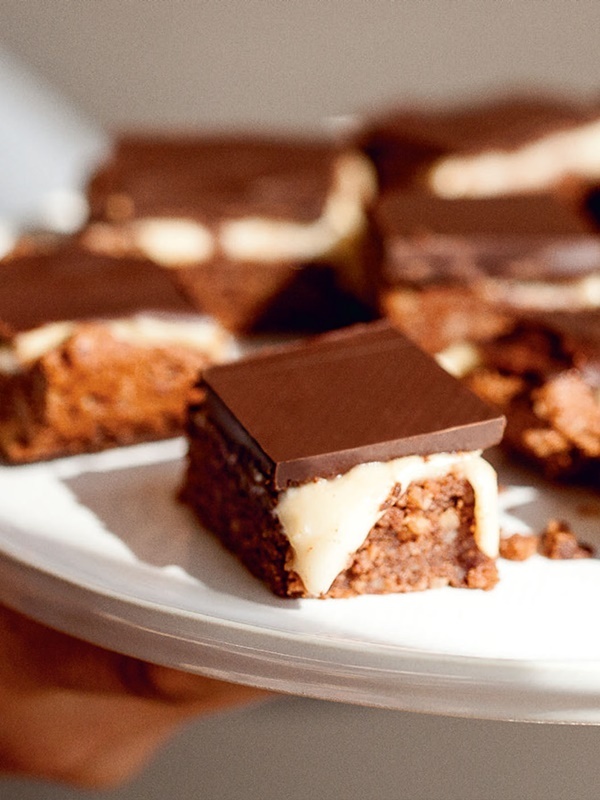 Her “delicious journey” includes recipes like Coconut Cacao Energy Bars, Dairy-Free Lacto-Fermented Vegetables, Garlic Green Beans with Roasted Cherry Tomatoes, Roasted Maple Balsamic Pears, Collard Green Sukiyaki with Buckwheat Noodles, Stuffed Butternut Squash with Tempeh, and of course, this amazing-looking Chocolate Peppermint Slice. Cacao Powder – This is the term often used to reference raw cocoa powder, though the two can be used interchangeably. Note that since no baking soda is used in the chocolate base, “natural” cocoa powder will be lighter and more acidic than “Dutch processed”. Arrowroot Starch – In most cases, starches (potato, tapioca, non-GMO corn) can be used interchangeably. Many “clean” recipes use arrowroot, but it can be pricey. For the small amount used here, you can sub another starch if needed. Coconut Nectar / Brown Rice Syrup – These are both liquid sweeteners. Your favorite liquid sweetener can be substituted, with a slight variation in flavor. The request for this recipe came via email from Australia. “Please clean up my husband’s favorite holiday dessert” it said. I quickly learned that Peppermint Slice is traditional Down Under, but its chocolate biscuit, peppermint icing and chocolate topping are anything but clean…until now. Enjoy mates! Preheat oven to 350°F. Line an 8 x 8-inch baking dish with parchment paper, with overlap on two sides. In a food processor, combine pecans, rice flour, cacao and salt and pulse to make a crumb-like mixture. Add coconut oil and maple syrup and process to form a moist ball. Place ball in prepared baking dish and press over bottom to form base. Bake 20 minutes or until top appears dry. Remove from oven and set on wire rack to cool completely. In small pan over no heat, combine coconut milk, coconut oil, extracts, and coconut syrup. Whisk in arrowroot, turn heat to medium and whisk continuously until icing thickens. Remove from heat, spread evenly over pecan base and refrigerate. In small pot over low heat, combine chocolate and coconut oil. Stir continuously until chocolate is melted and smooth and oil is blended in. Remove dessert from refrigerator and pour chocolate evenly over peppermint filling. Tilt the baking dish in each direction so that melted chocolate evenly covers the top. Sprinkle with coarse sea salt and refrigerate until topping is firm. Remove from refrigerator 30 minutes prior to serving. Lift dessert out of baking dish by pulling up paper. Gently cut dessert into 25 squares, about 11⁄2 x 11⁄2 inches each, and serve. Recipe reprinted with permissions from Eat Clean Live Well by Terry Walters. Copyright 2014, Sterling Epicure.